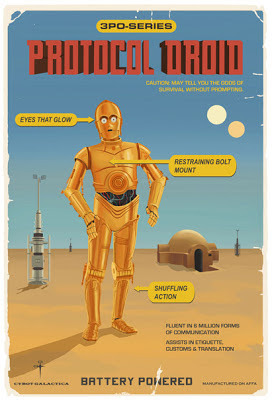 I'm working with Acme Archives Limited again on some more Star Wars prints. This time, instead of vintage travel images, I'm going with a spin on vintage toy box art. Ads you might see for certain droids from the Star Wars universe. I'm starting off with the inseparable pair of Artoo and Threepio. 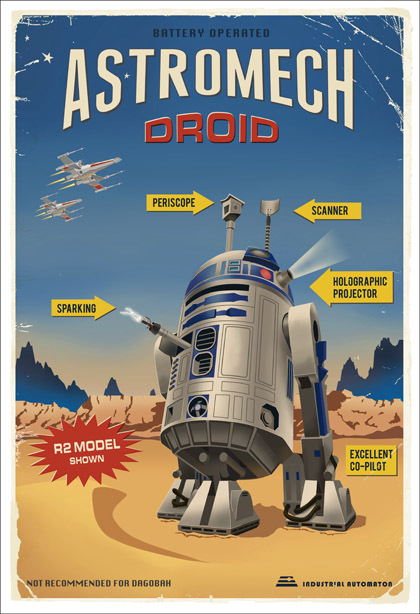 Artoo will be available this Thursday on Ltd Art Gallery's website and then on Acme Archives Direct. Threepio will be available a short time after - not exactly sure on the timing yet. I went simple with the descriptions on the droids' "options" to keep it true to the vintage robot toy art. "Periscope" sounded better than "Extendable Auxillary Visual Imaging System". Why haven't you been knighted or proclaimed a Saint yet? As a person dating a star wars lover, I am super hoping you might have something available pre valentines. Any hope?